What did you think of Ichi Sushi and Sashimi Bar? 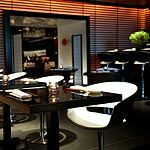 Small and perfectly formed, Ichi is a high-end sushi and sashimi bar hidden on the southern side of Westminster Bridge. Coupled with the Park Plaza Hotel’s Primo cocktail bar, with live music every night and stunning views across the river, this is a restaurant to make an evening of. 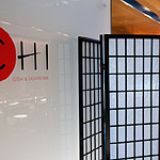 Not immediately visible from the outside, Ichi Sushi is located in the front corner of the hotel’s first floor. This section of the hotel is set to become a top destination on the South Bank, as the hotel currently hosts live jazz, salsa, funk and soul seven nights a week. Glass, elegant design and minimalism dominate the decor scheme for the four star hotel, and the same can be said for the restaurant. Glass top tables showcase a simple stone holding the chopsticks and stylish plate settings. The venue feels like a gastronomic pod at first, as the ceiling is curved at one end and the whole place only seats about thirty people. Oversized traditional Japanese blinds run along one side of the wall, and a tall vase of bamboo contrasts with the impressive vista of Big Ben behind it. The restaurant itself is quiet and laid back, but the bustle of the hotel and sound of live music often drift in and out of the conversation. The clientele are mostly from the hotel itself, although word is slowly seeping out onto the street. Only small groups can be accommodated, so the majority of people are in couples, a few groups of four, and the occasional single diner perched on one of the bar stools, chatting to the chef. The service is swift and friendly. The menu features sashimi and sushi, with a small number of rolls as well. Master sushi Chef Okamoto has 30 years experience behind the sushi bar; this expertise is evident in his dexterous knife skills and faultless presentation. The seaweed salad (£5.50), for example, is a delicate cascade of colours from the ocean. Conbu, Wakame and red and green Tosaka seaweed combine beautifully with carrots sliced thin as angel hair. Served chilled, the red Tosaka is especially delicious. It looks similar to frilly lettuce, but tastes like iced, salty vegetation. The salad is served with a creamy sesame seed and rice wine vinegar dressing. Although the dressing overpowers the delicate seaweed, it is absolutely delicious and the seaweed is handy to wipe the bowl of dressing clean. Deep fried, soft shell crab roll (£7.50) is impressive to look at and even better to eat. Rolled with avocado, roe and a creamy tomato sauce, the roll is served with a delicate Japanese orange sauce. Crab claws emerge out of the rice, pincers poised in a rather threatening manner. The chef chooses a young crab that has just moulted its shell, and then quick fries it in an earthy, rich batter to render the pincers and shell completely soft, edible and delicious. When the sashimi arrives, it is almost too beautiful to eat. Two pieces of Hamachi yellowtail (£7) and two Hotategai scallops (£5.50) are framed by a backdrop of interlocking cucumber fans, an arch of spicy leaf, shredded carrots and a bold yellow flower. The yellowtail tastes rich like butter, with a giving but firm texture. The scallops have an elusive taste that hovers on the cusp of the light, and yet dense, texture of the flesh. Both sashimi are served with fresh wasabi, as opposed to the dry paste which the majority of restaurants use. Fresh wasabi is stronger than the paste, but the burn evaporates just as quickly as it rises. 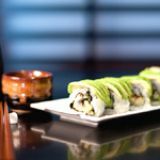 Fatty tuna roll (£7.50) features slices of tuna wrapped around rice, seaweed, asparagus, avocado and a hint of wasabi. The tuna is blowtorched to crisp up the outer layer and tinge the flesh with the flavour of outdoor cooking. 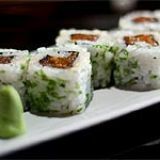 This roll is rich with fatty fish and creamy avocado, so it needs an extra dab of wasabi to cut through the indulgence. The Botan Ebi Nigiri demonstrates a delicate balance of shrimp flesh with sushi rice, and looks elegant with a single, juicy prawn a top of a small square of rice. Inari parcels of deep fried tofu (£5) are stuffed with rice and shitake mushroom. Small pieces of okra and green beans add a crunch to the rice, and slithers of pickled Gobo or Burdock roots slip in between to add a sharp tinge to the sweetness of the tofu casing. After such refined sushi, you would be better off ordering a sweet cocktail from the bar, rather than choosing a dessert. Although the carrot cake mousse (£5) and mango cheesecake (£5) are made by the hotel’s main restaurant, they are too sweet and uncomplicated after the masterful balance and craftsmanship of Ichi sushi. The drinks menu is as long as the Primo Bar, and includes a wide selection of liqueurs, cocktails, beers, red, white, and sparkling wines. As an aperitif, the Mandarin Wave (£9.50) is elegantly served in a martini glass with a delicate curl of orange rind dangling off the side. The cocktail is sharp and strong, with Absolut mandarin vodka emerging as a dominant taste. Honey smoothes over the acidity of the lemon juice however, to harmonise the blend of citrus and Sake. Jasmine Temple (£5.50) is a floral non-alcoholic iced tea, served tall with a shard of banana leaf, pomegranate juice, ginger and a dash of lime. The jasmine sneaks up behind the fruit juices, to leave a pleasant aftertaste of tea that lingers between the limes and ginger. 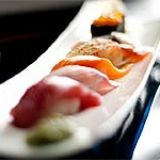 Japanese Asahi beer (£4) and sake (£5) are beverages that do not overpower the meal and refresh the palate between plates. Ichi means ‘one’ or ‘the best’, and Ichi Sushi is certainly the best sushi on the South Bank.